Sliding gates are highly effective sort after types of automation where the installation of swing gates is not feasible for securing your home, industrial & commercial property. 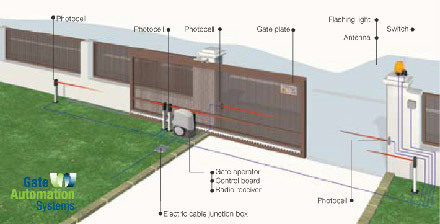 Gates range from pedestrian gates through to Entry / Exit gates up to 16 meters opening size. Gate widths upto 15 metres. Gate Automation Systems takes pride in training its staff to assist you in the decision making and advising of the correct sliding gate requirements & design parameters for your site along with the safety devices required for your specific application, along with the professional installation of the systems purchased.